A potential plot leak could have just given away some huge hints about Dean Israelite's upcoming Power Rangers reboot, and in particular the inclusion of Bryan Cranston's Zordon. In the words of Alpha 5, "Ay-ay-ay," someone could be trouble for this one. A potential plot leak could have just given away some huge hints about Dean Israelite's upcoming #PowerRangers reboot, and in particular the inclusion of #BryanCranston's Zordon. The Breaking Bad actor will stick his head in a jar to play the Rangers's mentor and face off against Elizabeth Banks's evil Rita Repulsa. It is clear that just like in the '90s TV series, Rita and Zordon have somewhat of a troubled past, but a picture on Instagram offers a potentially huge spoiler for what went down. It may not be the most talked about #superhero film, but for pure nostalgia alone, Power Rangers hopes to appeal to the kid inside of you, and if this rumor is true, it certainly makes everything a lot more interesting over in Angel Grove. The (now deleted) Instagram post belongs to actor Andrew Gray, who played the Red Ranger in Power Rangers Megaforce. 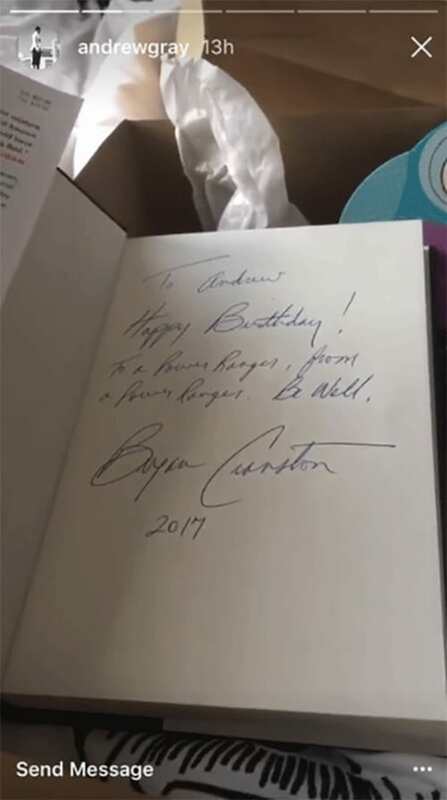 Gray featured a signed copy of Cranston's memoir, A Life in Parts, which included the handwritten message, “To a Power Ranger, from a Power Ranger.” It could just be a nod to the pair having roles in the Power Rangers universe, but the skeptic inside us isn't buying that for a second — particularly with its quick removal. It has been long-rumored that Cranston's Zordon is actually the original Red Ranger from 10,000 years ago. The story goes that Zordon will start Israelite's story as the Red Ranger, then trap Repulsa and her minions until she breaks free from her intergalactic prison, but not before he ends up sacrificing his physical form. It is certainly one way to update Zordon's ambiguous origin from the '90s series, where Zordon was trapped in a time warp and Rita was confined to a garbage bin on the moon. Having Zordon as an original Ranger, who defeated Rita, means he is more likely to know what our 2017 team are going through. It would explain how he became trapped in his secret base with Bill Hader until our rebooted teens stumble across him. Worryingly though, it begs the question, what happened to the rest of the original Rangers? While the idea sounds promising, it would surely warrant some form of flashback? We have already seen Cranston slip into those greying Y-Fronts for Breaking Bad, so as long as he doesn't stick on some Power Rangers lycra for a sequence, I'm all good. Director Israelite promised that his 2017 reboot would be in the same universe as the original series and films, but with over 23 seasons of everything from Lost Galaxy to Dino Thunder, how he can please all fans remains to be seen. Either way, we don't have too long to wait and all will become clear when Power Rangers is released on March 24.